I found this healthy body calculator online, which is pretty neat. I also find it funny that one of the optional questions is "Do you have any amputated limbs?" Cutting off a leg seems like an effective way to lose weight. And what do people without legs put for height? 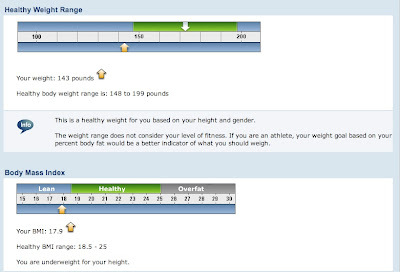 So yeah, put in your age, gender, weight, height, and limb count, and then see if you're considered healthy. Or perhaps "overfat." What a term! Fill out the extra stuff if you want to find out how to maintain, gain, or lose weight.